Emma Wright, center, of Blountsville, was crowned Miss Wallace State 2019 on Sunday, Dec. 2, at Wallace State Community College. 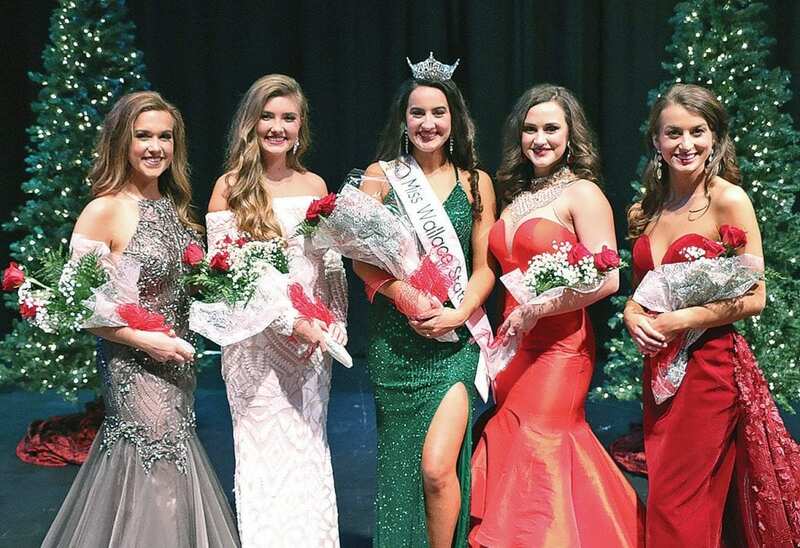 Other winners, from left, are Candra Cornelius, Beautiful Heart Scholarship winner, of Vinemont; Caroline Grimes, first alternate and talent winner, of Orange Beach; Wright; Anna Kaitlyn Shea, second alternate, of Oneonta; and Audrey McMickens, swimsuit winner, of Bremen. As Miss Wallace State 2019, Wright was awarded a one-year renewable scholarship to Wallace State valued at $3,500 plus $1,300 more in scholarships and prizes. She will advance to the 2019 Miss Alabama pageant in June at Samford University. She is a dual enrollment student from J.B. Pennington High School with plans to become a doctor. She is the daughter of Rob and Veronica Wright of Blountsville. Shea won $150 in scholarships. She is the daughter of Tracy and Kristina Shea of Oneonta and Brandi Trimble of Cullman.